Many people are posting their questions in the comments sections of various posts... i would prefer it if the questions were asked in only one place, from where they are compiled and sent to me to answer. Last YES!+ advanced course in the ashram was a Sattvic blast! 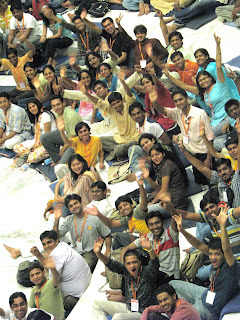 600 young people from all over India and a sprinkling from abroad arrived at the ashram for the YES!+ advance course. The sad part was that we had to refuse a little over 200 ‘cos the ashram was stretched to capacity (acco wise) and they were not quick enough to act on the registration (habits, patterns, old and new impressions made them believe everything can be done by trying in the last minute of the eleventh hour). Alas! 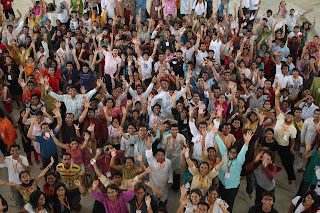 The excitement in the air was at its peak since four fifths of them were coming to the ashram for the first time. It reminded me of my first advance course back in ‘95 and how we could feel the energy from a few kilometers away while riding in the bus on route to the ashram. By the way, those who came a day earlier (always a good idea) were treated to a session of Mathemagic with Bawa. The YES!+ stay was in Khodays – a hostel style acco just across the ashram border, very much like the IIT hostel I stayed in with 280 rooms with 4 wings (2 for girls and 2 for boys). Some of the early birds who arrived first chose the rooms closer to the stairs to avoid walking all the way down the corridor and others chose to leave that convenience to those coming later. The later who thought about others were rewarded with the best view of the entire ashram from their rooms. Coincidentally that night Guruji spoke about Tyagabuddhi (an attitude of sacrifice), how you open yourself to receiving the highest with tyaga. I felt the creation is truly a play of paradoxes – when you let go something dear, the best gets to you. The day of talking was incredibly boisterous and yet it brought an amazing sense of serenity in its passing. You have heard about the evening in Roma and an evening in Paris, but the evening in the ashram is something to live for and sing about. Ashram is an enchanting land, sizzling with magic at every step. Steeped in tradition, rooted in ancient wisdom and dazzling with new born freshness. The evening in the ashram ambience is when nature shamelessly romances and flirts with the spirit of every thing and every being – trees, clouds, birds, animals, humans and even stones. The cool weather and the heady and lingering breeze caressing the leaves in the trees and delightfully ruffling the garments on the body and anything that falls in its way. The ashram breeze copiously suffused with sattva never fails to tickle my prana to an intoxicating high! 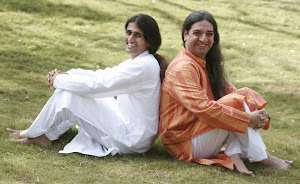 As silence descended over the ashram, the love became more and more dense, intense and palpable. The meditations were blissful, the processes; thought silencing and joy provoking. 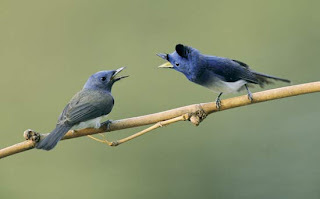 The divine is singing to you through the birds. (Guruji had once started a meditation with that line). So true!!! When all the birds are celebrating their evening home coming, the participants too were feeling more and more by the day that they have reached home. And truly there is no place on the planet like home. On day three, Guruji came to the session and walked in between rows of jubilant participants and mass hysteria (more of miss hersteria). And yet everyone was disciplined and hence Guruji had the freedom to do what he wanted and needed. More than pushing one selves onto him, the youngsters followed the principle of pulling him to them by their devotion and intensity of longing. After the darshan (blessings), we all sat silently with eyes closed and immersed ourselves with the shower of blessings. The knowledge that Guruji showered in Satsang was delicious, delectable and delightful about which I will blog here and there. 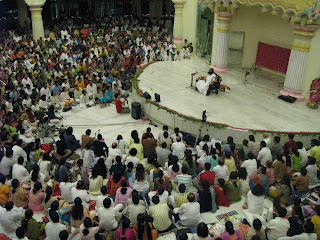 The last day after the last process, as everyone opened their eyes, there was Guruji sitting in the teacher’s seat. People rubbed their eyes, they jumped out of their seats cos for the life of them, they could not believe that Guruji was actually there. It took a full half hour of spontaneous sharing by almost everyone how they were praying deeply that Guruji should come right away. And Guruji had to make an absolutely unscheduled visit to be with them. It is said “Bhakt bhagavan ko sirf bhav se bandh sakte hai”. You can pull god only with devotion. And He in turn pulls you totally by his love. 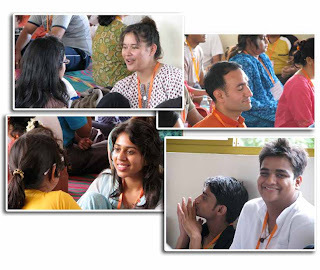 Give the best of your excuses, but you will get pulled to the ashram on 9th September for the 10-14 September (Bawa’s Birthday Special) YES!+ Advance Course. I just love the way you write. ping mamu! ping mamu! ping mamu! Dinesh, i really enjoyed the style of ur narration . it was a meditative trip , the feel of energy. Tyagabuddhi is some thing iam reflecting on. Tyaga is giving up some thing with the understanding of the higher. THANK YOU FOR SHARING THOSE PRECIOUS MOMENTS !!! ooo you made my day..
wow Dinu-da...you really have described the experience that i had alongside many others in a Fantastic manner...specially the view of the ashram from our room was really amazing!!! Im glad to have been refreshed of all those heavenly days spent at the ashram... and I wonder how amazing it is to even feel that Guru g's presence thru these lines by u! memories refreshed of the course. I had wonderful time in the ashram. Looking forward for December advance course. the rudra puja after the advance course was amazing. the rudra puja was=the advance course. ahhhh! Bhaiya u reminded me of the beautiful time we had during this adv. crs.. Anyways amazingly written. Keep writing more & more. I'll b waiting.And by d way one of the disgruntled participant you taught to flush the toilet was me. Thank you so much Dinesh bhaiya !! Aaj subah se I was thinking about the YES + Adv @ Ashram and all the masti we had...I woke up with this one thought in my head...something that you had told us at the course... 'Karam phal ki siddhi satva se hoti hai and satva se hoti hai aur satva badta hai sashna, seva aur satsang se'... lately work has not been going to well and I just realised that I hadnt done much seva for the whole of last month !!! Its amazing how clues like these pop up early morning...wow, I digressed too much...thank you so much for the post ! I feel rejuvnated after reading it and seeing all our pics ! Jai Gurudev ! JGD .. dinesh da ..
i also love the pictures.. especially the ones of Guruji..
Guruji's photo is really very very Nice... Wow, so Beautiful. 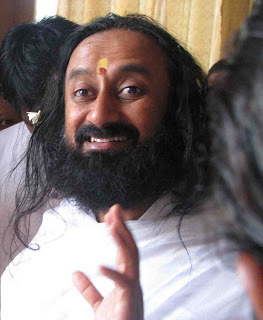 Ashram ... :D every particle bursting with His Grace and Love. ah!another post from dinesh bhaiyaa..
this is sooo beautiful! i woke up this morning missing the Ashram, and your post has brought me closer to home. hugs 2 you and bawa all the way from suriname-south america...when are you coming here? Your narrative about life in the ashram made me feel like I was actually in the ashram with guruji.I've not been to the ashram since 2005 and you brought alive the fond memories and bliss that is the ashram. Had tears in my eyes toward the end!wish I could be there soonn. Your post reminded of my first advance course (June 17-22, 08)...Ashram, Khodays, Kitchen Top and Guruji...how amazing experience that was. DADA...U ALMOST MADE ME CRY WITH D SPEECHLESS MEMORIES OF MA FIRST ADVANCE COURSE.....U KNOW EVEN D THOUGHT BRINGS SO LOT OF BLISSFULNESS IN MEE DAT I CANT EVEN EXPRESS!!!!! !AND D THING WHICH IS IMPOSSIBLE TO 4GET IS THE SIGHT AND MEETING OF GURUJI EVERY SINGLE DAY!!!!!!!!!!!! !.....KEEP POSTING PING MAMU...!!! very attractive pics, really feeling like flying to aashram. wish to be in the ashram for advance course as soon as poossible. Bau, you seem to have lost weight again. Hope you're taking care of your health...you take fabulous care of all of us though ! wow Dinesh Bhaiya..Thanks for the TREAT...FINALLY!!! i love it dinesh bhaiya! Reading you for the first time. i liked it. simply superb...it was like reliving the awesome course! yay! i will do bau special advance course! This is why I always wait for your post. Every morning I wake and see have Dinesh bhaiya posted today??? Particularly, description of Ashram ambience was amazing and of unique style. wow...that has to be your longest one by far! 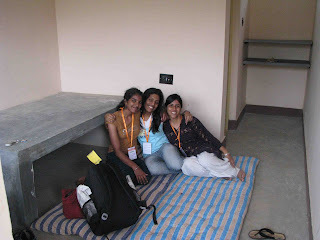 !loved it...miss Ashram..need an advance course:-(...EXAMS...WAAAAAAAAAAAAAAAAAAAAAAHHHH!!! dinesh bhaiya i loved ur post.this was my first advance course n u reminded me of the beautiful days i had spent in the ashram.n im also there in the photo tht u hv put in.this bought a broader smile on my face.plz keep postin more. Your writing style outshines the best and it simply took me out for a trip in ashram just by sitting here in Mauritius! And ya nature out there leaves us with no choice but to fall in love..
wow... thanks a lot bhaiya for posting this... it just refreshed the memories of the beautiful days spent in this advanced course..
i am reading it again and again, every line is so beautifully written, and u rightly explained the ashram's magical atmosphere..
and o, i am delighted to see myself in our group pic..
really such an awesome post,flash back of 5days being in ashram n advance course in presence of guruji. really dat was the time what is GURU in life? am all the more exited now @!!!!!! Afterall the with has been worth it. And loads of thanks for penning down your thoughts on our behest. (just trying to appropriate the credit:-)). 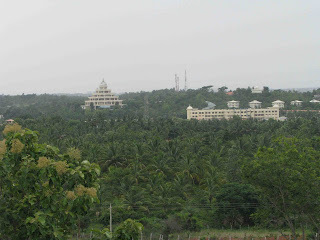 The blog has given some solace to the heart that's aching from separation of my beloved Ashram. Please do keep Writing more and more..
You are just plain marvelous. 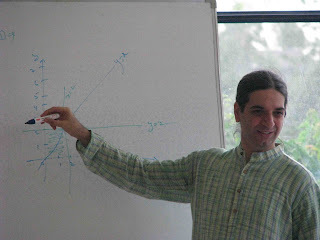 Love Bawa's pic teaching math.. It captures the thrill he experiences while teaching. This is a picture of a man who is really living. what a narration ! it is so picturesque!..thanks for sharing!!! Don't Look at the Moon!! I respect your privacy and I am committed to safeguarding your privacy while online at this site bawandinesh.blogspot.com The following discloses how I gather and disseminate information for this Blog. Like most blogging platforms I use log files, in this case Statcounter. This stores information such as internet protocol (IP) addresses, browser type, internet service provider (ISP), referring, exit and visited pages, platform used, date/time stamp, track user’s movement in the whole, and gather broad demographic information for aggregate use. IP addresses etc. are not linked to personally identifiable information. This Blog contains links to other sites. Please be aware that I am not responsible for the privacy practices of these other sites. I suggest my users to be aware of this when they leave this blog and to read the privacy statements of each and every site that collects personally identifiable information. This privacy statement applies solely to information collected by this Blog. I use outside ad companies to display ads on this blog. These ads may contain cookies and are collected by the advertising companies and I do not have access to this information. I work with the following advertising companies: Google Adsense, Scribefire and Bidvertiser. Please check the advertisers websites for respective privacy policies.